A week later on the other side of town, many of the same students were folding up pinochle tables at Corvallis Senior Center to make way for a free pet care clinic for low- income seniors. Later they were joined by volunteer veterinarian Ryan Scholz of Ark Animal Care who provided exams, flea and tick care, vaccinations, and just plain old advice for owners and their pets. 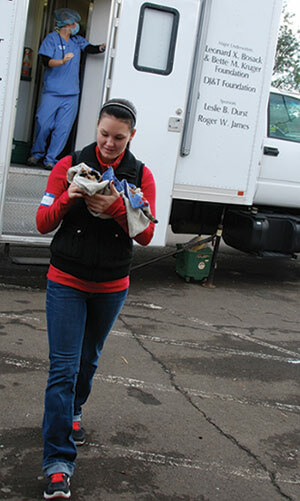 In addition to the many hours they donate to free clinics throughout the state, OSU veterinary students also work throughout the year raising thousands of dollars in donated food and supplies for local animal shelters. In December alone, they gathered more than 600 pounds of dog, cat, rabbit, and goat chow. And that’s just the work they do locally. Many of the same students are involved in global charities as well.